I was worried that I'd left my white cotton running gloves at my sister's house at Thanksgiving, but while packing my gym bag this morning I found them in a jacket pocket. They're disposable gloves, that's their purpose in life. Runners often bring them to the start of a race so they can keep warm at first and then just drop them along the course without worrying about a valuable piece of gear. You can buy them for $1.99 at any hardware or garden store, they're ugly and crude. So why did I care if I lost that pair? My brother brought them to my house a few years ago the first time he ran the Boston Marathon. When I started running seriously last fall I used them to keep warm because they were what runners wore. I knew this because my brother wore them. They were a safety blanket for me, a reassuring touchstone that connected me to "real" runners. 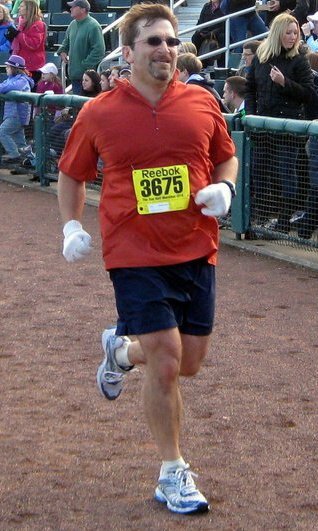 No matter how slowly I ran, or how out of shape I looked I could tell myself that others would recognize the common badge we shared and identify me as a runner. Was it true? Probably not, but if it helped me get out there and run it was a white lie, if only to myself. 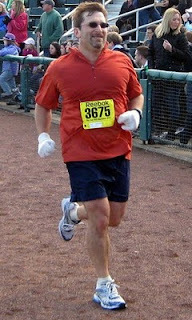 I like the connection to my brother, as well as to the other runners I see wearing cheap cotton gloves. Lately I've been feeling a part of the community of runners, even seeking out others to run with, something I never enjoyed before. But the connection to my novice running self is equally important. It's a nice reminder of how far I've come and the progress I've made. I have several pair of polypro and windblocker gloves that I use when the conditions warrant, but I still fall back on these white cotton gloves on days like today when I need them. They make me go faster in the same way that racing stripes make a car go faster, but I had a smile on my face when I finished my run today.